Fiona Dunbar on Stories, Science and Series. My agent will be giving Dylan and Mouse a gentle push into the world very soon. It’s a new thing for me, writing a series, and challenging. Ever the professional, not just seeking an excuse to read yet more children’s books, I researched the genre by reading a lot of series fiction. 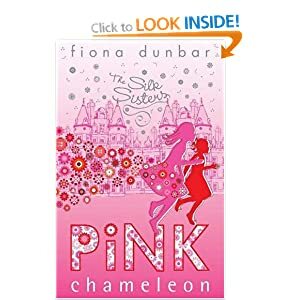 During this process I came across The Silk Sisters trilogy by Fiona Dunbar. Trilogies differ from series in a number of ways, but boy, did these books teach me some things about tight writing. Fiona creates new worlds and characters as effectively as if she were painting them and her story arcs are an architectural wonder . The Silk Sisters books are a romping mix of science fiction and adventure and I was thrilled when Fiona agreed to talk to me about them. What made you want to write a trilogy set in the future? I didn’t! It sort of happened by accident. I started out wanting to use fashion as a theme, because﻿ it has always interested me – but it doesn’t lend itself to storytelling very easily! It’s just very visual. Then I started reading up about Smart clothing and I was really excited by the possibilities there. Also, fashion is all about identity, and that got me thinking along the lines of identity theft; what if the technology existed that would literally enable someone to steal a person’s identity? Was this your first attempt at science fiction? Yes, and as the concept grew in my mind, I kept telling myself, who do you think you are? You’re not a scientist! I wasn’t sure I was ‘qualified’ to write science fiction. But then I realised that what passes for ‘science’ in this story is really more fantasy than anything. All you need for a story like this is a starting point – the technology that exists now, and its projected development over the next few years – and the ability to imagine the directions in which that might go. It’s made up! It isn’t real, folks. ﻿﻿ ﻿Talking technology, you have people carrying around things called shels – those are basically iPhones, right? Well, whatever version of that we’re likely to be carrying around in, say, twenty years’ time, yes. I just don’t call them iPhones, for obvious reasons. But you have to call them something. Certain aspects of the world I’ve built here are very recognisable, because I wasn’t interested in writing something set in the year 2525 or something; it’s deliberately a world that’s kind of just around the corner. Also, you have to reflect the reality that not everyone has super-duper cutting-edge technology. We have cars you can instruct verbally now, but only a tiny minority of people have those. So you’re really talking about the world we live in today? I think that’s true of any dystopian fiction. And the truth is, you can’t talk about fashion without addressing the side of it that is very ugly indeed – more so now than at any other time in history. What I hope readers will get from Silk Sisters is an understanding that the more stuff you acquire, the bigger the cost to other people. WHO is going to sew all those sequins on that dress that retails at only £9.99? Someone slaving away for next to nothing in a sweatshop somewhere in India, that’s who. High street shopping has become a moral minefield. But the Silk Sisters isn’t about sweatshops in India. No, that’s right. I’m sure there’s a very good book to be written on that subject, but I’m probably not the one to write it. But I do hope that in Silk Sisters, the overall point about the human cost of indulgence is not lost. I really love the combination of accident and magic that underlies Rorie’s transformation. What gave you the idea for her chameleon powers? Thank you! All my books have a supernatural element – I can’t write naturalistic stories! So it was logical that for Silk Sisters, that element would relate to clothing. It’s also a metaphor for adolescence – as is the caterpillar/butterfly motif that runs through the trilogy. In adolescence you go through the biggest physical change you are ever likely to experience, and that holds an enduring fascination for me. Not only that, but in a sense you try out different identities during this time: which social group do you belong to, or aspire to belong to? What music do you like? How do you express yourself though the way you dress? These things are incredibly important to you at that age. I’d love to be able to do that now! It makes me feel sorry for Elsie, Rorie’s younger sister. Rorie has this amazing power but Elsie is just an ordinary kid. Why does nothing supernatural happen to her? ﻿﻿﻿ Elsie as the one who gets all the laughs and does outrageous things. She’s usually the one whose actions move the plot along, because she is so utterly sure of herself and has no inhibitions. Also, in contrast to Rorie, she is obsessed with fashion! Given that the plot centres on the fashion world, it made sense to have someone like this – Rorie isn’t really interested at all. So which character are you: Rorie or Elsie? I’m a bit of both! When I was Rorie’s age (13) I was much more like her: a follower, rather than a leader. I always latched onto someone more confident, more pro-active. It took me years to outgrow that…probably not until I reached my thirties! So I guess that by giving Rorie her chameleon powers, I’m indulging in a bit of wish-fulfilment, because that process is accelerated. Rorie is thrust into extreme situations and is forced to act on them; she emerges a far stronger, more confident person at the end. As for the Elsie side of me: well, when I was her age (7), dress-up was absolutely my favourite thing to do. Again, it’s all about experimenting with roles, and that’s an important part of growing up. I still love an excuse to dress up – but having said that, I actually spend most of my time slobbing around the house in jeans and an old t-shirt, and I revel in that too! Most dystopian fiction is aimed at adults or young adults. What made you want to write a dystopian trilogy for tweens? Because that’s the age group I’m used to writing for, and I never seem to tire of it! As I say, that age of 12/13 holds an enduring fascination for me. Also: why not? If no one else is writing this sort of thing for younger readers, then all the more will come to me! I’ve got a fantastic postbag of fan-mail for Silk Sisters, so I must be doing something right. I suppose the only difficulty has been one of perception: I think it may have missed a whole swathe of potential readership because for whatever reason, it’s sometimes assumed that this is some sort of chick-lit thing, and it isn’t. That’s not a criticism of chick-lit, by the way – it’s simply not an accurate description of what I’m doing here, that’s all. Where do you think that perception comes from? Pink and Sparkly belies Tough and Sparky. I think it’s a bit of a snobbery thing, to be honest; because my writing is largely humorous, it’s sometimes perceived as trivial. It’s the same with covers; pink & sparkly sells, but the downside is that some people are put off by that. I’ve thought that about the covers – I love the Japanese versions, they’re fab. Ahem, back to the important bit, what’s between the covers. Did you find the trilogy easy to write? No, it was incredibly difficult! After the success of Lulu Baker, I was asked to follow up with another trilogy, which meant constructing something I knew from the outset would have enough mileage to fill three books. It wasn’t like that with Lulu Baker, where initially I was just happy to get the first one published! Then the others followed on – but there was no Master Plan, as it were. So yeah, it was hard…that’s why I’m now writing a series. It’s easier! I’m glad to hear series writing is easier – and I can’t wait to read your new books. It’s the Kitty Slade series isn’t it? Are you finding it more fun to write? Oh I wouldn’t say more fun – I had loads of fun with Silk Sisters! But also a lot of agony. This is just more straighforward, because I get to start afresh each time with the storyline. Inevitably the characters evolve a bit from one story to the next, so there is a bigger story arc of sorts – but I prefer to make things up as I go along. I realise now that I’m not a big one for detailed forward planning, plot-wise. I’ve been stuck so many times, and every time, without exception, the reason for that has been thinking I had to have the whole thing mapped out in advance. It takes confidence to trust your instincts and just let the words flow, and I think I’ve finally learned to do that without agonising too much. One last thing – when can we read Kitty Slade? 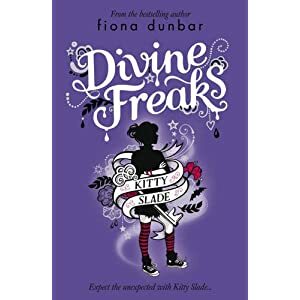 There will be six books in all; the first one, Divine Freaks, is out on May 5th, and the second one, Fire and Roses, is out on September 1st. Once again, there is a supernatural element, in that Kitty sees ghosts. Sometimes there’s a historical element to them, sometimes crime – and always a mystery to be solved. If my readers find them scary and funny at the same time, I will have succeeded! They sound great. Thanks for answering my questions Fiona. Thank you. Your writing is so lively and entertaining, and I can’t wait to see your books on the shelves! Previous Post Still banging on about libraries. Next Post I’m cross now, hands off our libraries. Thank you both – that post was also lively and exciting. And educational too! Good luck with Dylan and Mouse, Kathy. Brilliant interview! So enjoyed reaching it – thanks to both Kathy and Fiona! Very enjoyable interview. Thanks Kathy and Fiona. Looking forward to reading the Kitty Slade mysteries: scary and funny sounds perfect. And to reading Dylan and Mouse before too long! Great interview – thanks Kathy and Fiona. Fab Kathy. I am so excited about Dylan and Mouse !!! That was really interesting, thank you both. Fiona, I loved Lulu Baker! 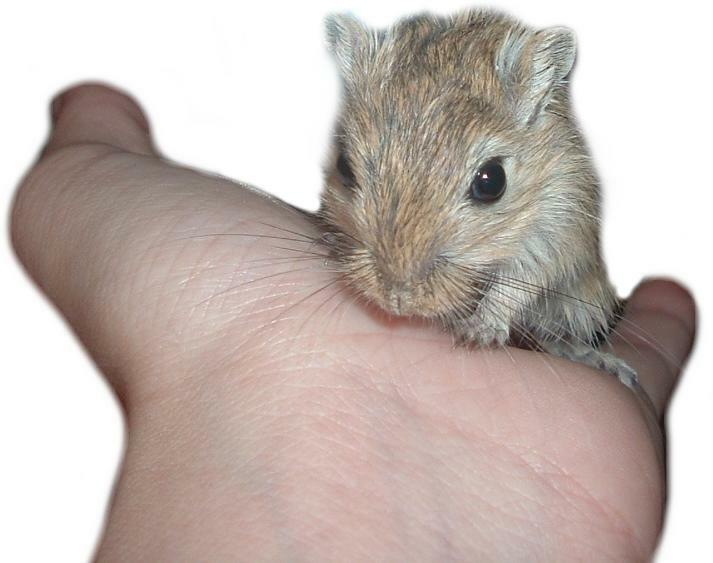 Kathy, I love Dylan and Mouse! Great interview, both! Kitty Slade looks brilliant – such a clever cover, conveys funny/spooky/history/mystery perfectly. Looking forward to it. And good luck with D & M! Wonderful interview, and Kitty Slade is going to catch my Lulu at exactly the right moment. She even has the same legwarmers! Hope it – and Dylan and Mouse, Kathy – take the world by storm! Very interesting, must go and read the Silk Sisters… it sounds so close to the kind of thing I write….! And good luck with D&M Kathy! I like the picture of Fiona with her head in the pink hair dryer.